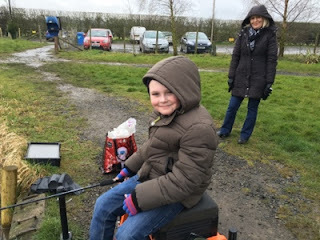 There have been quite a few articles about needing to get young people involved in Angling, so when asked if you'll take someone fishing for the first time, how could I refuse? So, it was Samuel's 7th birthday and his Mum, Lianne was asked by Samuel if he could go fishing. A quick message on facebook and we sorted out a date when I'd be back in Teesside to get him out on the bank. Where do you begin with regards tackle for a new angler? Well Korum provide some great kits for beginners, a float, ledger and pole outfit. I decided to get the Korum Float Pack Starter kit. The only change I made was replacing the 6lb line for some 4lb line which I had plenty of. Fish safety is number one, so I grabbed an old landing net head and handle to add to the kit and some other floats, shot, a towel, rod rest, bank stick, some more ready made hooklengths and bait tub. The gear was ready!